A title that tells Mom exactly what she wants to hear! 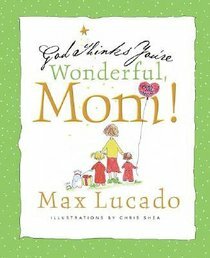 God Thinks You're Wonderful, Mom features the lighthearted, encouraging writings of Max Lucado and the whimsical illustrations of Chris Shea. Celebrating the wonderful attributes of motherhood, this book reminds moms everywhere just how important they are and how much they are appreciated. This is the perfect gift for Mother's Day and beyond. About "God Thinks You're Wonderful, Mom"
Chris Shea uses her enchanting artwork and strong writing skills to create one-of-a-kind greeting cards and gift books that have earned her great respect in the greeting card, licensing, and publishing communities. A best-selling author and highly acclaimed artist, Chris loves to touch hearts with hope and love. Chris lives in La Mesa, California.- Publisher.